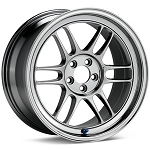 All Enkei Racing Series wheels deliver the latest in wheel designs and alloy casting processes from their high-tech manufacturing facilities. Their rigorous Spec-E testing exceeds JWL and VIA strength test standards and represents Enkei's commitment to higher quality and safety. Founded in 1950 in Japan, Enkei has a presence in Asia, North America, Latin America, and Europe with factories in Japan, Southeast Asia, and the United States. 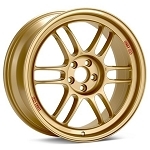 Their business in the aluminum wheel industry ranges from very sophisticated racing wheels for Formula One, WRC, Formula Nippon, Super GT Series, Super Taikyu and Drifting worldwide, to the OEM market that supplies some of the largest auto and motorcycle manufacturers such as Toyota, Honda and General Motors. Enkei Racing Series wheels are manufactured using the MAT (Most Advanced Technology) process. MAT is a new technology for producing an aluminum wheel by combining Enkei's MAP (Most Advanced Production) and flow-forming forging technology. MAP is a highly automated system. Each process is connected in a single-piece flow system that transports wheels from the melting process, through heat treatment and on to machining. The process of spinning the rim vs. casting it to both shape and elongate it produces a finer, more even aluminum structure and ensures the wheel will remain lightweight yet strong. The complete MAT process has a drastic impact on the microstructure of aluminum and results in outstanding improvement of the mechanical property of the material. As wheels and tires become larger, use of the MAT process to manufacture wheels becomes even more important. In order to reduce weight under a vehicle's suspension, larger wheels must remain light. Enkei Racing Series' new generation of 10% - 15% lighter weight, forged MAT wheels are strong and retain optimum anti-flex properties. 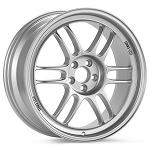 Then, to create the unique styles for today's market, Enkei Racing Series combines their high-tech casting technology to create the face of the wheel with the new MAT process that forms the rim, maintaining levels of performance similar to fully-forged wheels without the limitation of design that fully cast wheels present. Finishes include Enkei Racing Series' unique SBC (Special Brilliant Coating) finish. SBC is a chrome-like synthetic coating that can be applied to lightweight wheels via a powder coating process that results in a brilliant, flat surface that is easy to maintain and suitable for use in winter weather conditions. 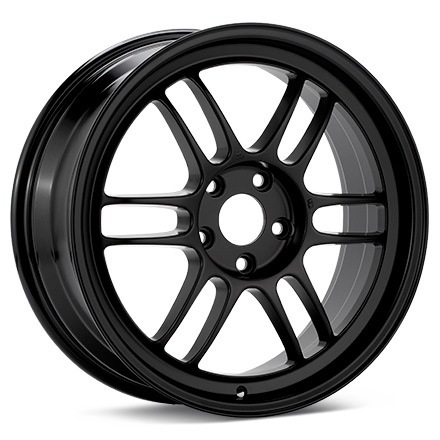 Enkei Racing Wheels are backed by a lifetime structural warranty. A limited warranty guarantees wheels will be free from defects in materials and workmanship under normal and reasonable use.